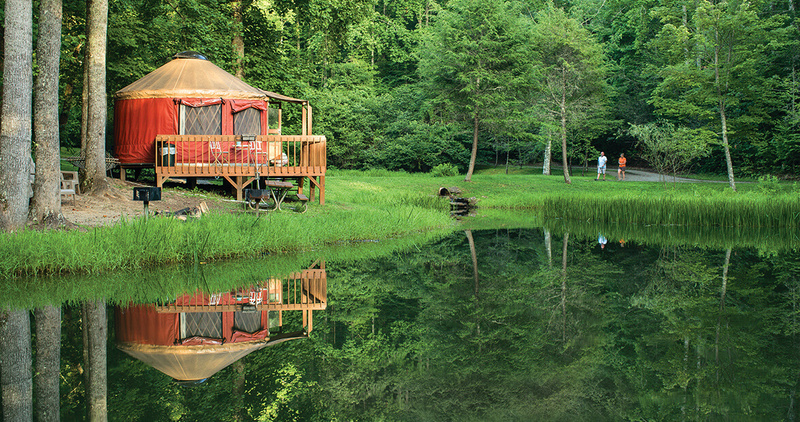 A yurt resort overlooking Fontana Lake offers campers far more than s’mores. The rug is a simple thing. Maybe 3 feet by 5 feet, with a purply-red tone to it. Nothing extraordinary, but it’s making me feel guilty. So are the lamps. And the refrigerator. Honestly, the fact that I have a room at all is a real problem. I’m in the Nantahala Gorge, a rugged chasm that’s known mostly for its whitewater rafting, but that also has incredibly steep and technical hiking. I find myself in this gorge a lot, whether to fish or paddle or hike or camp, but I’ve never experienced the Nantahala from the plush digs of a yurt. Yurts are those foreign-looking round structures that were all the rage back in 13th-century Mongolia. I know because I recently binge-watched Marco Polo, the Netflix series that follows the famous explorer’s adventures with the Khan clan. The Khans, and, really, all nomadic Mongolians, were all about the yurt. The circular structures stood up to the heavy winds of Central Asia’s steppe grasslands, and were light enough to carry from location to location. They were also easy to erect; a family could have their yurt up in about an hour. Nomadic Mongolians moved frequently — about three times a year. So they were basically camping, but they were camping in style, with strong walls and a roof, furniture, even a fireplace. Genghis Khan supposedly had a massive yurt mounted on a wheeled cart that was pulled by 22 oxen. Think of it as the original recreational vehicle. The Nantahala Gorge is about as far from ancient Mongolia as you can get, and yet there’s a village of yurts right here at Falling Waters Nantahala, in a hardwood canopy on a bluff overlooking Fontana Lake. Eight of them, all the same burnt-sienna orange, are clustered near two small ponds, but shielded from each other by big hardwoods and skinny hemlocks. Each yurt has a sizable deck, and communal charcoal grills, picnic tables, and fire rings are scattered throughout the village. When I show up, fresh off a brutal hike up one steep wall of the gorge, kids are fishing the ponds, moms are putting dinner spreads on picnic tables, and dads are drinking beer on their porches. The whole thing has a summer camp feel. The resort is relatively small — just 22 acres — but it’s tucked inside the Nantahala National Forest, with trails leading from the yurt village into the forest. Wildwater, a rafting company that guides trips on some of the South’s most iconic rivers, built the yurts in 1998, the first yurt village in the area. Wildwater was actually the first commercial rafting company in the Southeast, guiding trips on the Chattooga River more than 45 years ago. My yurt has small French doors with a key code lock. A sweet deck wraps halfway around the thing, and inside there’s a futon couch, lamps, a fridge and coffeemaker, a queen-size bed, and that rug to bring it all together. There’s a skylight and a ceiling fan, and a space heater in case I get chilly. Extra blankets, too. It’s all so very civilized, and it stands in stark contrast to the rugged gorge surrounding it. You probably wouldn’t know it from driving U.S. Highway 19 along the banks of the Nantahala River, what with its outfitter stores and boiled peanut shacks, but the Nantahala Gorge is wild. The walls of the canyon rise immediately from the water, climbing in a steep tangle of hardwood trees, rock cliffs, and rhododendron. The entire ditch is a little more than eight miles long, and capped with 5,000-foot peaks on either side. The Cherokee who lived here called it the “land of the noonday sun” because the canyon walls were so steep that the sun only hit the ground in the middle of the day. If you want to get a feel for the true vertical nature of the terrain, hike a five-mile stretch of the Bartram Trail from the river to Cheoah Bald. The Bartram, named for William Bartram, a naturalist who traveled across the Southeast in the late 1700s, is a steep single track cut right into the slope of the gorge wall. It crosses the bubbly Ledbetter Creek, then climbs and climbs, through dark rhododendron tunnels; around thin, fin-like boulders; and beside a rocky, narrow gulch surrounding the creek. The canopy hovering above the trail is thick and colorful in the fall. The sun only breaks through in patches, coming down in big, vertical shafts, piercing the foliage above and spotlighting big leaves and tangled vines. At times, it’s a narrow, barely-there path passing primo campsites that rarely get used. The Bartram is like the Appalachian Trail if nobody ever hiked the Appalachian Trail. It’s rugged. The yurt, on the other hand, is anything but. Usually, after a day in the woods, I camp. I’ve had wonderful nights camping in the past. Nights when a small fire kept me warm and the sky was clear enough that I could fall asleep staring at the stars. I’ve also had my share of torturous stays in the forest. Nights when I shivered uncontrollably and woke up with frostbitten toes. Nights when my tent flooded. Nights when I had to dig out a foot of snow before I found a patch of dirt for the tent. Nights with no tent at all because I hadn’t been planning to camp (I got lost while bushwhacking and had to hunker down at the base of a tree). 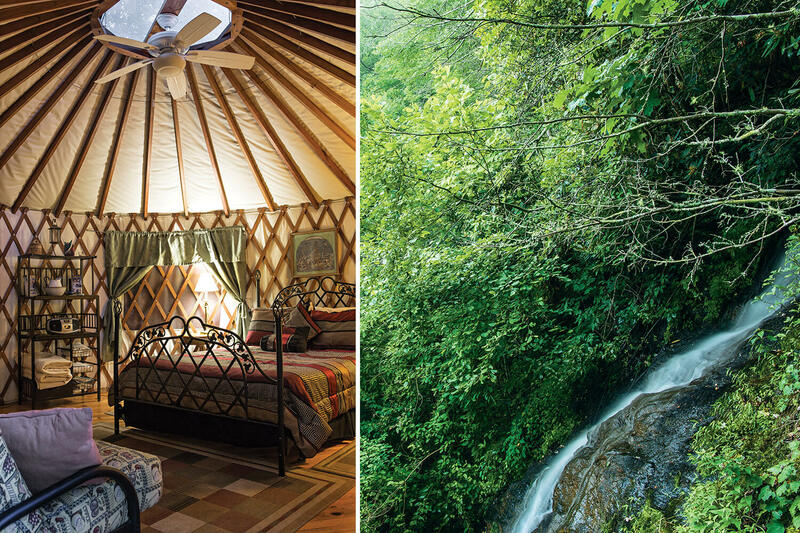 I love camping, but when I heard about these yurts, I thought, Maybe there’s a better way. Maybe I can spend the night in the woods and not suffer. A yurt isn’t camping, but it’s not a cabin, either. It’s something in between. I brought a steak for the grill because I think that’s what Genghis Khan would have had for dinner. Typically, I’m heating up some freeze-dried cardboard in a featherweight camp stove. I sit on my porch, eating the steak and drinking a beer I picked up at a general store inside the gorge, and listen to the frogs bellowing from the pond just down the slope. Somehow, the steak and the beer overpower any sense of guilt I was feeling about my comfortable digs. Or maybe it’s the yurt itself. There’s gotta be a scientific study somewhere about the calming effects of living in a home without any right angles. The yurts are made out of insulated canvas — a thick wall held up by lattice on the inside. Small wooden beams rise from the wall to the skylight at the peak of the ceiling. Late that night, I lie in the bed, reading the guest book left on the bedside table. There’s a passage from someone named Diane, who apparently took a trail from the yurts to Fontana Lake and went skinny-dipping. I make a mental note to find that trail tomorrow. For now, it’s just the yurt and the frogs croaking outside, their deep voices drowning out the crickets. I turn on the fan and get back in bed. Then I turn on the heater. Just because you can’t do that when you’re camping. September 2018 Welcome Letter: Advice for a First-Time Camper?